You can buy one at Whole Foods. Butternut Squash Soup: Farmers Market. Gourd. Cut in half, remove seeds, bake till a knife slides out easily. Usually 40+ minutes at 350-400. Then, remove the skin, add water, and blend. Also, consider nutmeg and cinnamon for flavor. The perfect Thanksgiving appetizer. Turkey: Whole Foods sells Free Range, Organic, and Heritage turkeys. All are way more expensive than the $5 dollar supermarket birds, but buying a smaller bird makes it okay. Not as many leftovers but a better conscience. Mashed Potatoes: Potatoes aplenty at the farmers market. Vegetables (corn on the cob): This changes every year. For this one I’m thinking corn on the cob, barbeque-d, reminds me the most of the original Thanksgiving meal. 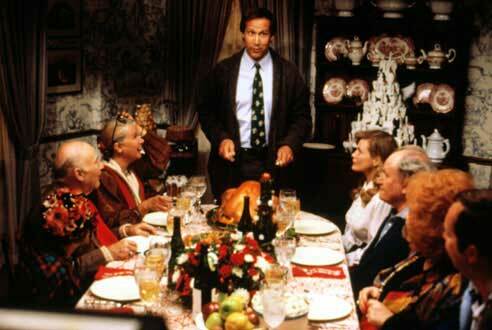 Gravy, Cranberry, Stuffing: Unfortunately, I haven’t found a local or organic source for these items. I think it’s because they are complicated to make and they never sell cranberries at the farmers market. Have to save that for next year. Pumpkin/Apple Pie: Yumm. Every market has these. Whipped Cream: Milk by the glass. Every Whole Foods in the nation sells this now and so do most natural food stores. I like Straus Family Creamery from Mother’s Market. Knowing my Mid-Atlantic roots, I hope to one-day introduce some seafood into our Thanksgiving meal. The closer to the pilgrims and natives the better! Something scary is happening in the turkey world. Our scientists and farmers have created a Frankenstein-like beast called the broad breasted white. This creature is created in a lab, through artificial insemination, and then grows fat so fast that it often cannot walk. It usually needs antibiotics to survive to be butchered. Needless to say, it cannot fly. It can also barely walk, but it does create the biggest turkey breast you could ever imagine. If that wasn’t enough these creatures are shoved into tight pens with thousands of other birds. All of them too fat to walk around, struggling to survive, and sometimes even injected with butter and salt. Profit, pure and simple. Americans want $5 turkeys and don’t care how they get it. When there is a will there is a way, and this way has been found. The only thing I can think to say…is it worth it? The modern turkey (the Broad-Breasted White) has been selected generation after generation for two main traits: white meat and fast growth. The oversized breasts of the Broad-Breasted White render it incapable of flight or natural mating. As it matures, it has difficulty walking. The heritage turkey, on the other hand, is closely related to its wild ancestors; it is heartier, healthier, and capable of natural mating, running, and flying. 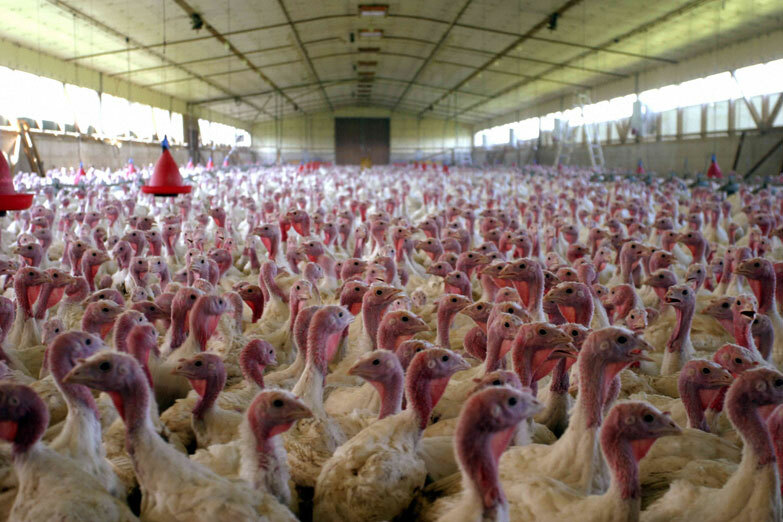 This enables farms raising heritage turkeys to raise them without drugs. It also makes them more work to raise. Heritage Turkeys: Worth the Cost? 1. 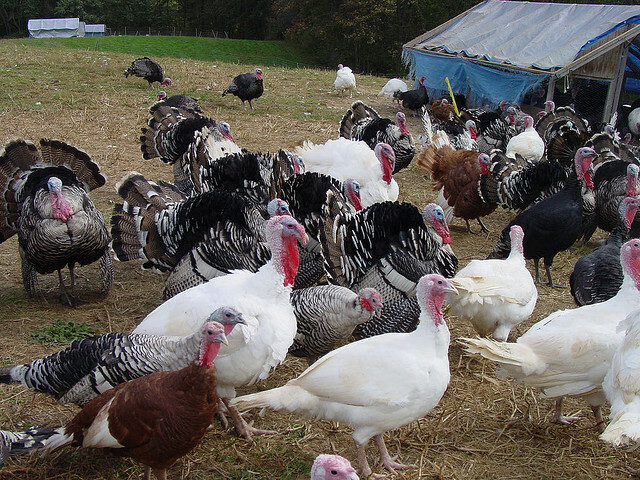 Naturally mating: the Heritage Turkey must be reproduced and genetically maintained through natural mating, with expected fertility rates of 70-80%. This means that turkeys marketed as “heritage” must be the result of naturally mating pairs of both grandparent and parent stock. 2. Long productive outdoor lifespan: the Heritage Turkey must have a long productive lifespan. Breeding hens are commonly productive for 5-7 years and breeding toms for 3-5 years. The Heritage Turkey must also have a genetic ability to withstand the environmental rigors of outdoor production systems. 3. Slow growth rate: the Heritage Turkey must have a slow to moderate rate of growth. Today’s heritage turkeys reach a marketable weight in about 28 weeks, giving the birds time to develop a strong skeletal structure and healthy organs prior to building muscle mass. This growth rate is identical to that of the commercial varieties of the first half of the 20th century. Heritage Turkeys are the ancestors of the common Broad-breasted White industrial breed of turkey that comprises 99.99% of the supermarket turkeys sold today. But the Heritage Breeds still exist and are making a comeback. More than ten different turkey breeds are classified as heritage turkeys, including the Auburn, Buff, Black,Bourbon Red, Narragansett, Royal Palm, Slate,Standard Bronze, and Midget White. Despite increasing interest in heritage turkeys, they are still a tiny minority, perhaps 25,000 raised annually compared to more than 200,000,000 industrial turkeys, and most heritage breeds are endangered in some respect. Posted on November 13, 2011 Author robotchampionCategories defaultTags cost, dinner, drugs, growth, heritage, holiday, hormones, meal, thanksgiving, turkeyLeave a comment on What is a Heritage Turkey? I’ve never done a recipe post before, but I have to talk about my breakfast burritos and fish tacos. In the small world of “me” they are legendary. I’ve started surfing and my apetite is ravenous. Being from Southern California I have to – absolutely required to eat fish tacos. 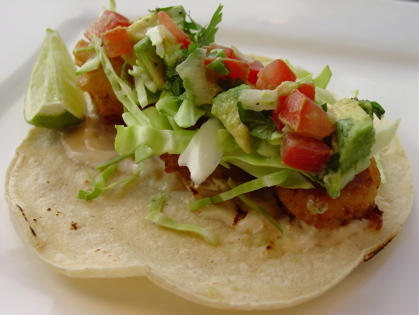 The best place to enjoy a fish taco in Orange County is the secret spot, Bear Flag Fish Company. The place is always packed with surfing families, potheads, and high school dates. No need to recommend anything because you should try them all. They also sell fish by the pound (sometimes local fish too). This is where I start my fish tacos by ordering up a pound and grill it at home. Fish is the easiest thing in the world to BBQ. Just throw it on the grill, cut down the middle to check it out, and when dry but oily take it off. Next comes cabbage, the secret fish taco ingredient. Not much taste to cabbage (red or green) but it is a crunchy-wet-filler for the fish. Tortillas, say it like this: torrrr-tiya with as slick an accent as you can produce. I use small corn tortillas that smell delicious, which as far as I can tell is the only way to determine quality. Heat them up a little first (10 seconds in microwave). Lay the fish down first and the cabbage on top of it. If you prefer the creamy route then lay down some sour cream with hot sauce on top. This is key, you must lay the hot sauce on the cream, it’s magical that way. Vegetables, like pico-de-gallo (diced tomatoes, peppers, onions) or avocado round out the fillings. Just remember that less is best, don’t make a potpourri. The tacos are for dinner but in the morning it’s all about the breakfast burrito. 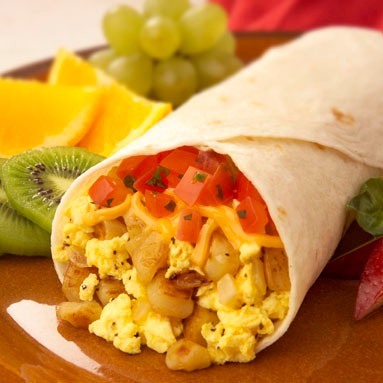 The challenge to making a good breakfast burrito are the potatoes. These crunchy delights serve up the best burritos but take forever to prepare. Your best bet is to pre-cook them on a weekend or something and make a huge batch. Boil them, then pan-sear ’em (turn pan on high, burn/crisp as much as possible, maybe use oil). With taters in hand move on to the typical ingredients: large flour tortillas (heated in microwave, 10 seconds), eggs, sour cream, pico, avocado, sausage, etc. The key is to combine the taters and warm tortillas with the best ingredients on hand. If needing protein go for a meat (sausage or soy-rizo, which is spicy tofu) or eggs (scrambled vs easy). If not, go the vegetarian route. I only buy food at the farmers market so the ingredients always change. Right now the best item I’ve found are bean sprouts, I don’t know what kind but they are tasty and healthy. Enjoy making your Mexican-American feast and share any tips you have!